Okay - giving in to those of you who keep telling me that I need to put a picture of me up...so here I am. Not the one you will usually find in front of the camera, but behind it capturing your memories. 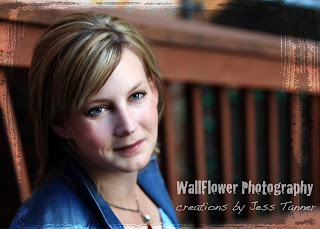 Picture was taken by the other wonderful part of WallFlower Photography and my husband- Jason Tanner. Jason specializes in sports & action shots.